This week I have been assisting with a fascinating enquiry about the well known Edinburgh surgeon Alexander Miles (1865-1953). 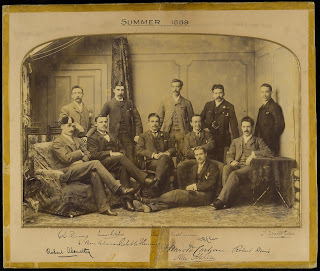 I began by looking in the Royal Infirmary of Edinburgh, Registers of Doctors (LHSA reference: LHB1/119/1-2), and was able to find entries for him first as a resident surgeon in 1888-1889 and then as a supervisor to the residents from 1910 onwards. The resident physicians and surgeons were newly qualified doctors who were receiving further training at the Royal Infirmary. More information about the Royal Infirmary of Edinburgh Residents. I then looked in the published UK Medical Directories (available to consult in the Centre for Research Collections Research Support Collection). I was able to trace each of the addresses Miles worked at from when he qualified in 1888. 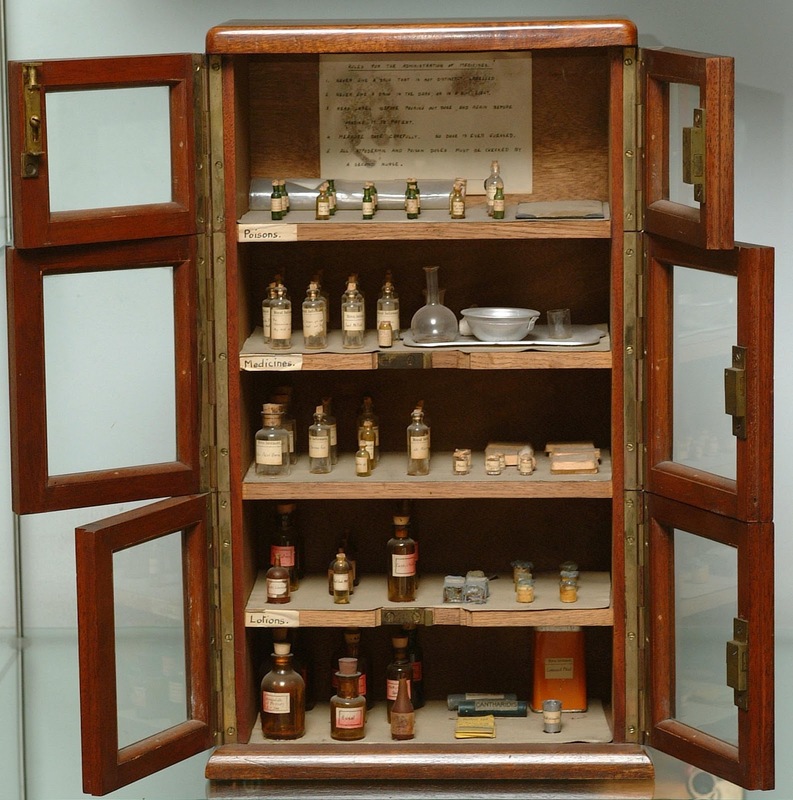 This source also stated that he was elected as a fellow of the Royal College of Surgeons in 1890. I also looked at LHSA’s reference library and found a detailed biography of Miles in The Edinburgh School of Surgery After Lister by James A Ross, 1978, Churchill Livingstone. (LHSA Reference: Ref 8/47). Miles went on to become a lecturer in anatomy in Edinburgh University, surgeon to Leith Hospital, lecturer in surgery at the School of Medicine of the Royal Colleges. He wrote a Manual of Surgery with Alexis Thomson in 1904. He was also joint editor of Edinburgh Medical Journal 1911-1935 and wrote The Edinburgh School of Surgery before Lister in 1918. He was secretary, treasurer, then president of the Royal College of Surgeons. He was in his day considered “the best all-round surgeon in the Royal Infirmary”. This enquiry response shows the variety of sources which LHSA has to hand to help answer the many enquiries we receive each week. We’re delighted to be loaning Edinburgh University’s School of History, Classics and Archaeology a number of items from our object collection. 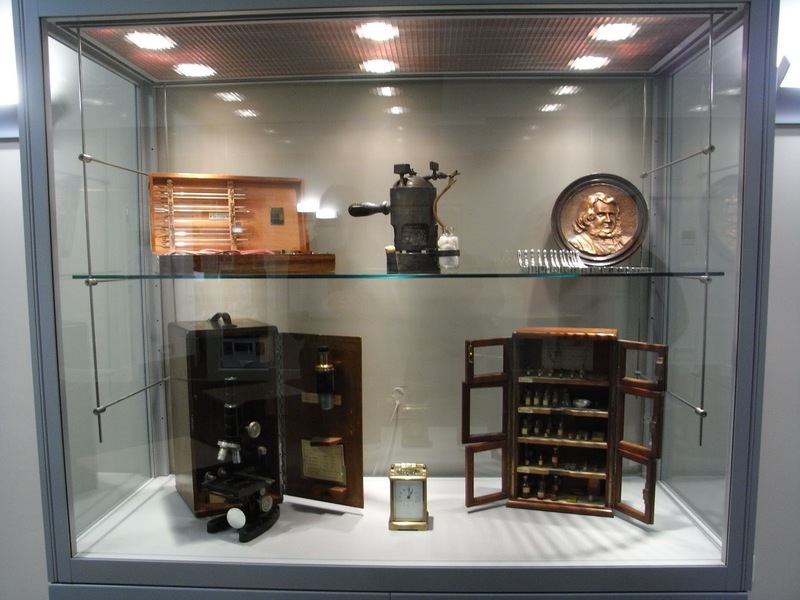 They will go on display in the exciting exhibition spaces created within the newly refurbished department. LHSA staff have worked with representatives from the School to select objects that fit the themes of their exhibition, but that are also robust enough to withstand a period of prolonged display. Where items that were selected by the School were deemed too fragile to be loaned, we have provided digital image facsimiles. 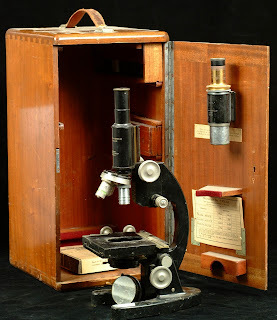 LHSA is keen to make our unique collections as accessible as possible but we must make sure that access is not to the detriment of long-term preservation. We also work to protect collection items on loan in other ways. We liaise with the borrowers to ensure that the display conditions are of a high enough standard, draw up transfer paperwork that ensures that the collection items are properly protected during the loan period, and carry out a conservation assessment to record the condition of the items before they leave LHSA storage areas. We delivered the objects to the School today and arranged them in the display case. The results are fantastic as you can see! As part of the Unsung Heroes project, LHSA took part in 'Bring a Badge Day' held at the Sanctuary in the Royal Infirmary of Edinburgh, Little France on Thursday 10th February. Nurses and ex-nurses were invited to come along, bringing their nursing badges to show project staff and eca (Edinburgh College of Art) students. 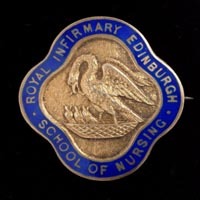 LHSA provided a small display of nursing badges, a selection of Royal Infirmary of Edinburgh photographs, and showed the "Ever Open Door", a silent film made by the Infirmary in the 1930s promoting the hospital, its services and new departments. A representative from the Royal College of Nursing was also present with a fantastic display of badges from their 3,000-strong collection. Also present were staff from the eca, who described to the various visitors how their badges were made and designed. There was a good turnout, including a number of 'Pelicans', nurses who trained at the Royal Infirmary of Edinburgh and received their pelican badge on completion of their training and one year of service. The pelican was chosen to represent the charity and self-sacrifice of nurses, pelicans being known to feed their young from their own blood. What came across from chatting to the pelicans was how special their badges were to them as a symbol of the hard work put in to their training and the dedication required. They proudly wore their badges throughout their careers, and treasure them after they have retired. One ex-nurse said that being a pelican was like being in a club, where ever you went across the world, (and many went on to work all over the globe), you'd bump into other pelicans and they were like old friends, even if you hadn't previously known them. We also heard some great stories about life as a nurse, living in the Infirmary nurses home. From toga parties using hospital sheets as costumes, to nurse's boyfriend's sneaking in fish and chips for patients via ward windows! Part of the Unsung Heroes project is to record these memories so that they can be saved for the enjoyment of future generations. For more information about the project, visit their blog. To view a slideshow of a selection of LHSA's enamelled badges, visit flickr. This week, Laura, our Assistant Archivist talks about a new opportunity for volunteers. LHSA runs a flourishing volunteer programme which allows us to give people the chance to gain some valuable experience of working in an Archive whilst also providing us with the opportunity to complete small cataloguing and rehousing projects. Demand for volunteer placements with us is high; competition for places on archive courses is fierce and applicants with experience of working in an archive are more likely to be successful. At the moment we have one regular volunteer, but unfortunately we’re unable to accommodate everyone who applies. We put our heads together to think of a way in which we could help some more prospective archive students. The solution we came up with has been trialled for the first time this week: a one day volunteer programme or ‘mini work experience placement’! 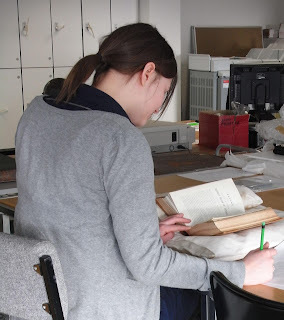 Claire Kirkpatrick spent the day with us in the Archive, experiencing a variety of archival and conservation tasks. The day started with an introduction to LHSA and a tour of the stores. This was swiftly followed by training on enquiries; LHSA receives about 600 remote enquiries a year and Claire was shown how we conduct research in order to answer them and then was able to have a go herself. After some training from our Paper Conservator on how to handle and store photographs, Claire re-housed a collection of 27 photos and slides from Lothian Health Board. In the afternoon, Claire enjoyed a tour of the Digital Imaging Unit before being shown how to catalogue the photos she had re-housed in the morning. The day was very successful for LHSA in that another small piece of cataloguing has been completed; it was also very useful for Claire who said “I wasn’t sure what to expect but it turned out to be a very hands-on, interactive taster session and I gained valuable knowledge on the basics of cataloguing and dealing with enquiries. Being able to chat to staff about how they got into archiving was also really very helpful.” We’re glad Claire found it so useful and hope to be able to offer another one day volunteer programme in the near future. Where: Royal Infirmary of Edinburgh, Little France, Edinburgh, EH16 4SA. Come along to the Unsung Heroes project 'Bring a Badge Day'! See the beautiful collection of historic enamelled nursing and hospital badges from the Royal College of Nursing Archive and the Lothian Health Services Archive. Bring along your own badge or a badge that is in your family to learn how it was made from our badge expert Elizabeth Turrell. 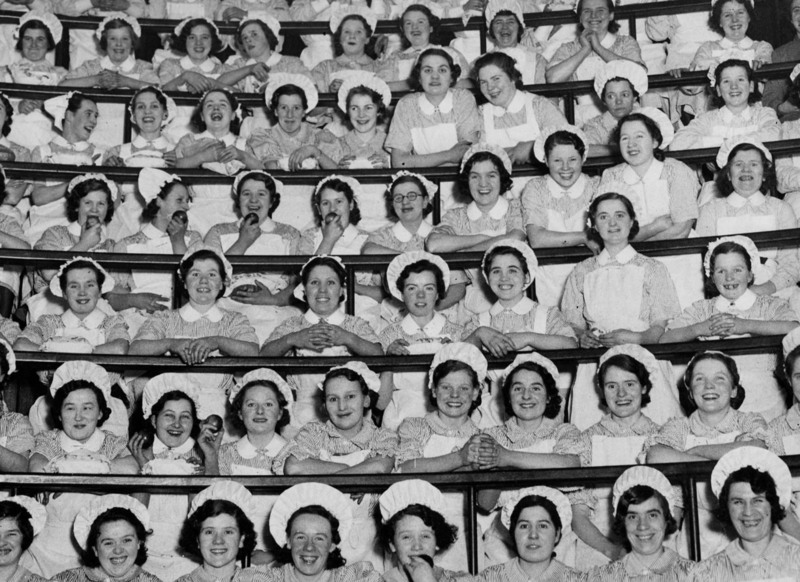 If you are a nurse, health visitor, midwife, working or retired come along and share your memories for our archive. We’d love to record them. You don’t have to work at the Royal Infirmary of Edinburgh to come along. You can be a badge enthusiast, retired or working in healthcare, or just an interested member of the public. 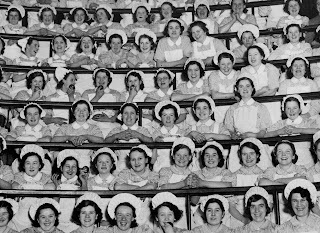 Watch the silent film made in 1938 about life at the Royal Infirmary. If you are a Pelican nurse, find your name in the register which will be on display.